MacCrellish, a Bostonian, suspected that others would appreciate a similar awakening, but she could not find any nonacademic art gatherings on the East Coast. So she decided to start one. She had moved to an off-the-grid, hand-built solar house in Sandwich, a town with three art galleries and no gas station. She discovered the idyllic place for a retreat in her backyard: Rockywold Deephaven Camps on Squam Lake in Holderness. The camps nest at the southern cusp of the White Mountain Forest on the shore of Bennett Cove in Holderness. Rockywold, built in 1897, has been described as “champagne in a tin cup’’: down comforters on beds with pillow-top mattresses in vintage cabins canopied by pine, sugar maple, and birch trees. Tapping the maples was a tradition there until the late 1980s. A fog of steam would rise from the sugarhouse as the sap boiled and guests would invariably tote jugs of souvenir syrup home. The cottages are comfortably rustic, each with its own dock, porch, and fireplace. On summer days, ice cut from the winter lake is delivered to the cabins. MacCrellish had the venue to moor her dream but the camp owners were skittish. When they said no, she vowed to stop daydreaming; she couldn’t imagine holding the retreat anywhere else. The next day, the owners called with a change of heart. 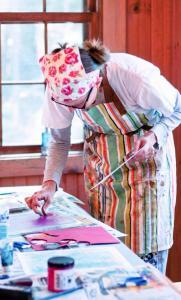 Ten months later, in 2008, Squam Art Workshops (SAW) began. She evokes that artistic sense with the story of a young girl who asked her art professor father about his job. “I teach people to draw,’’ he said. “You mean they forget?’’ she replied. Because this principle tran scends any particular medium, SAW offers a sampler menu: Classes such as weaving, photography, woodworking, food styling, journaling, theater, and music are offered from summer through early fall. The June session favors textiles, while the September one has a mixed-media bent. In both cases, Squam muddies the distinction between craft and fine art, believing that knitting, felting, and other domestic crafts can be aesthetic as well as utilitarian. After starting with one gathering in 2008, MacCrellish devised new sessions for this year: A Reader’s Retreat where “drowsy fabulists’’ convene on a wraparound porch, nurse wine, and talk literature. It’s a respite for “people who believe there simply aren’t enough hours in the day to spend nuzzled between the pages of a good book,’’ says MacCrellish. During Squam by the Sea, attendees stay in beach cottages on Nag’s Head Island in the Outer Banks of North Carolina for bonfires, yoga, mixed media, and memoir. SAW is summer camp for really big kids. When they’re not knitting Latvian fingerless mitts, Squammies can hike (trails from the property climb East and West Rattlesnake mountains), hunt blueberries and raspberries, fish for lake salmon, swim, or captain a Sunfish to Potato Island. Squam Lake, the location for the movie “On Golden Pond’’ because of its pristine water, is seven miles long, spring fed, and punctuated by 28 islands. (One Squammie stayed with her in-laws across the water and kayaked to class each morning.) During a paddle to Otter Island, attendees often spy bald eagles and great blue herons. As they sit on their docks, knitting and purling, they hear the ghostly songs of loons. The 115 acres serve as a muse to many. One class hunts twigs and stones for organic sculptures (think artist Andy Goldsworthy), another pockets leaves to print botanical designs on fabric, and yoga unfolds in a restored barn with a view of Whiteface Mountain. When the sky turns dark, there are open mic coffeehouses and stitching circles around a fieldstone fireplace. The opening ceremony features Jonatha Brooke, a renowned folk-rocker who teaches songwriting at SAW. The stage is a bonfire. Her accompaniment? Clacking knitting needles. After working in isolation, Soucy gained a community of crafty friends here. Once the leaves fall, Squammies reunite to letterpress Christmas cards and swap designs, bartering baby sweaters for patchwork aprons. While they’re mapping quilts, MacCrellish is back at the homestead, planning future sessions in hopes that SAW will make children of a few more adults. Denise Dowling can be reached at d2dowling@msn.com.